This was only the very small amount of Eastwoods underhood satin black, a few squirts of Gibbs Brand and a few meters of electrical insulation tape. About four hours all in, that includes the masking, spray and custom loom making. Obviously if you have a correct loom this will save a lot of time. The centre console like the aircon unit was looking very sad and tired. The centre console was an added optional extra on my car so I obviously wanted to keep it and put it back in. The black was looking grey and the scratches all over the black paint as well. With the success of the of the aircon unit I cleaned up I decided this would get the same treatment. As the console was of the car it was so much easier to work on. There was a few little cracks that were fixed by adding some plastic glue to strengthen it up again. On the underside of the console is where the retaining clips are to hold the metal top plate to the plastic base. Undo the sprung nuts and the small screw on the front of the plate at the front and the metal will lift off. Once this was removed I could see all the dirt and grime that needed to be cleaned, I’m not sure how it got so disgustingly dirty but from the picture you can see it needed doing, not that I knew it was like that to start with! I started on the underside of the removed metal plate, this was cleaned with the Gibbs Brand and came up clean straight away. The Gibbs will also protect the finish from rusting. Clean the top surface with a warm water solution and some degreasing materials after that ready for spraying. Once the plate has dried, mask the chrome off with insulation tape (or what ever you want to mask it with) ready for spraying. The black was again the Eastwoods Underhood Satin Black to match the aircon unit. The same preparation was done to the rear ash tray as this was also looking even worse than the console itself. On these pics you can see the black paint has been scuffed off. A couple of light passes with the spray can put the life back into the black area again and covered the scratches up. I place the freshly painted surface in a dry area in the sun to dry while I worked on the rest of the console base. The back of the console has some courtesy lights with a plastic face plate to diffuse the light. This was broken and still held in place via the three screws. Remove the three screws to allow the old lens part to be removed. On the underside of the console at the back is two screws. This holds the earth strap and the bulb plate to the fitting itself. Once the two screws are removed the fitting will fall away from the console itself as well as the bulb plate. I de-rusted the metal plate and cleaned the contact points ready to go back in later. The light fitting was all chipped and no chrome remained what so ever. I rubbed the flaking parts of and cleaned with some degreasing agent. Primer undercoat applied and allowed to dry. Application of the top coat silver spray and lacquer was applied as per the instructions. Again the bulb fitting was allowed to dry in the sun. While these parts were drying, the cleaning the plastic console was easy with the Gibbs Brand and only required a couple wipes over to bring it back to life and leave a nice lustre finish to complement the chrome and satin black. The bulb plate had no wires running to the front and I assume there was a pig tail loom to allow the connection. Both the live part of the bulbs had a wire with a bullet style connection. I made a double join on one side of the bulbs and that extra connection made a spur point and went to the other side bulb for the live feed. The earth connection was also joined by bullet connection. A length of cables was run to the front of the console and clipped into place with the cable clips that were all still there and not broken. Replace the bulb fitting into the back of the console and replace the two screws that hold the fitting in place, remember that one of the fittings holds the earth strap to the bulb plate. Check the bulbs for operation and replace with working ones as required. I insulated the bullet connections although I didn’t need to, addition of red tape was used around the outside of the made connections to show me which was live, the feed wire that was routed to the front was also red, the earth wire was in black for the consistency. Once secured in place the front opaque lens was screwed back into place with the three screws that had been cleaned earlier. 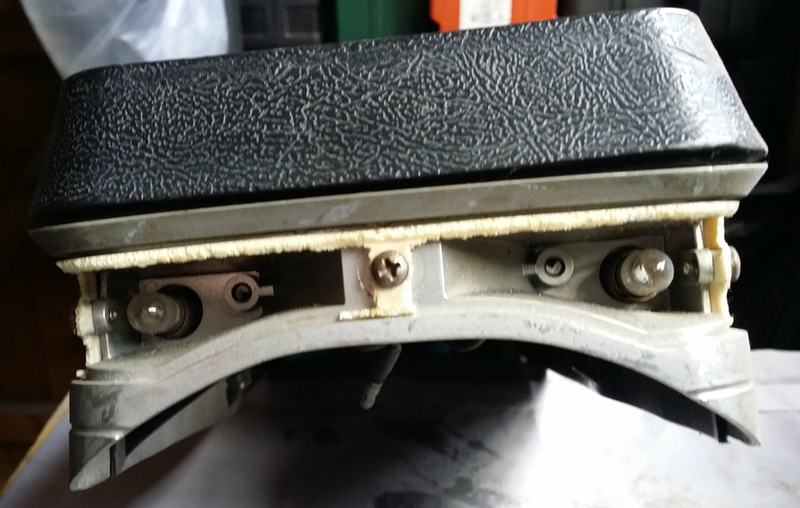 Take the top plate and place back onto the top of the console and turn over in order to apply the spring nuts. As the area around the nuts looked a little fragile I used larger washers in order to spread the load out evenly across the plastic. Tighten all the spring clips and replace the smaller front screw. I removed the insulation tape once it was in place along with the ash tray once it had been fitted back into the console. That’s it, job done. The console now has a nice black finish that looks correct for the time and will now match the aircon unit with the same shade of black. This whole job didn’t take long and the results are so much nicer. The images here don’t really do the work justice just like the aircon unit. But you have to trust me. it looks sweet. Would I recommend it? Definitely I would. The console will be getting some wear and tear I expect so this will make a big difference in the car. For the time taken and the results achieved it’s well worth the effort.